The Foxtail Palm, Wodyetia bifurcata, is one of my favorite palms. It has a nice full look and it is “self cleaning” so you do not have to try to trim off brown fronds because they simply fall to the ground. If you look at the part of the palm where the trunk meets the leaves you will see an area called the “crownshaft”. This crownshaft is essentially an extension of the leaf that wraps around the trunk where it is attached, so when the leaf dies it essentially lets go of the trunk and falls off. 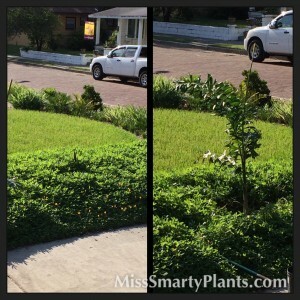 Less pruning equals less work! The green crownshaft of foxtail palms is very attractive and helps make them easy to identify. 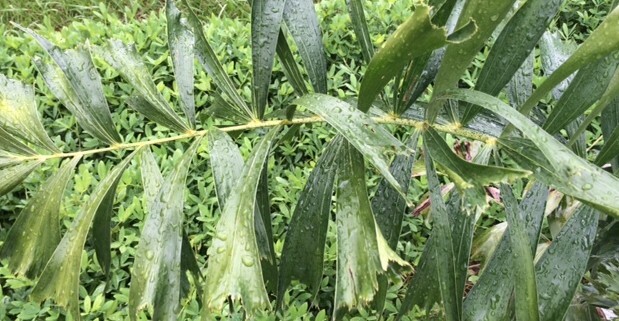 While most palms with these distinctive crownshafts are very tropical, the foxtail palm does well in central Florida and can tolerate occasionally cool temperatures. Like all plants, a more mature palm will have much less damage than a small, young plant. 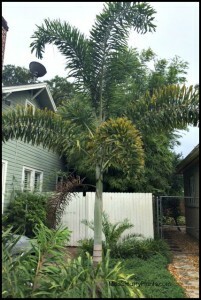 The photo above shows our largest foxtail palm that borders our driveway. It was about three feet tall when I planted it four years ago and now it is probably 15 feet from ground to the tallest palm frond. At one point we had three planted in this narrow strip with an underplanting of perennial peanut. The other small palm is fine but one died last year and needed to be replaced. 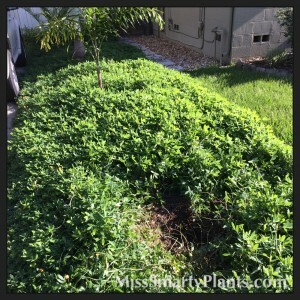 The first step in getting this area ready to plant was to trim back and remove some of the peanut that was so dense. It will help reduce competition with our new palm for water, but most importantly, made the digging much easier! 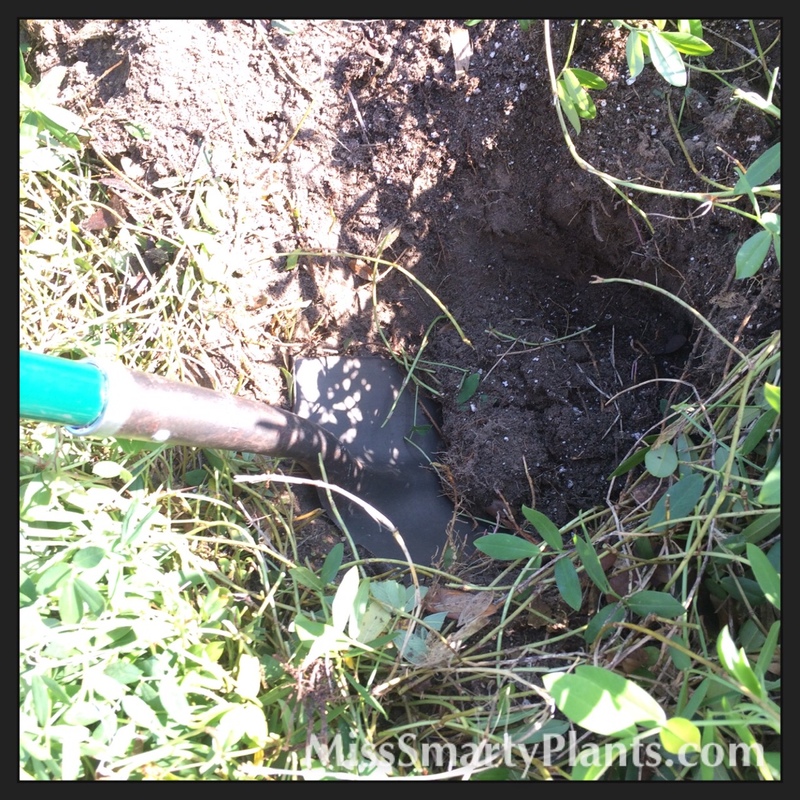 The soil here is very sandy and made the digging very easy for planting. Knowing how fast these grow and the increased price for a larger palm, I decided to get a small plant that was in a 3 gallon pot. It will be easier to get established in the ground and I like the staggered look of different heights also. 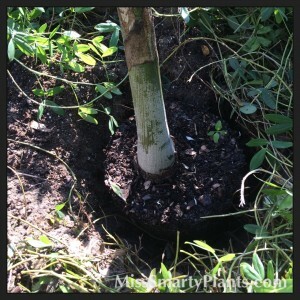 The key for planting palms is to keep them at the same depth in the ground as they are in their pot. It is so easy to plant these too deep and you really have to pay attention to getting the depth right. 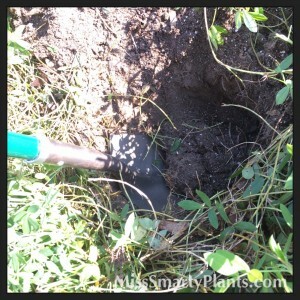 To make sure that it is at the right depth, go ahead and set the plant, container and all, in the hole. You want the soil levels to be similar. 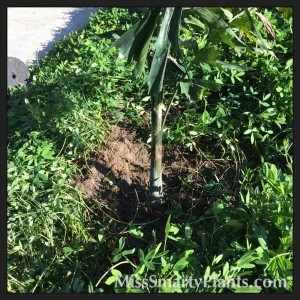 It is fine to go ahead and make the hole more wide as it will just make it easier for the roots to grow outward, but if you dig a hole too deep the soil will settle and the palm will end up too deep and not grow very well. 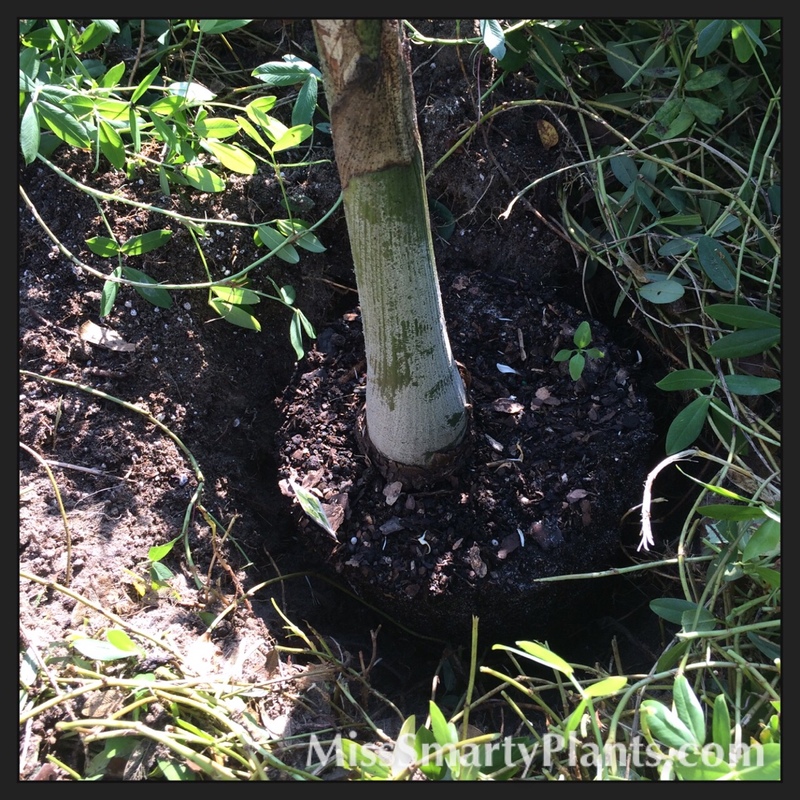 Once the hole is at the correct size, remove the plant from the container, set it in and begin to backfill around the roots to stabilize your foxtail palm. Most small palms will not need any staking or supports because they just aren’t as top heavy as a really large palm with a small root ball. 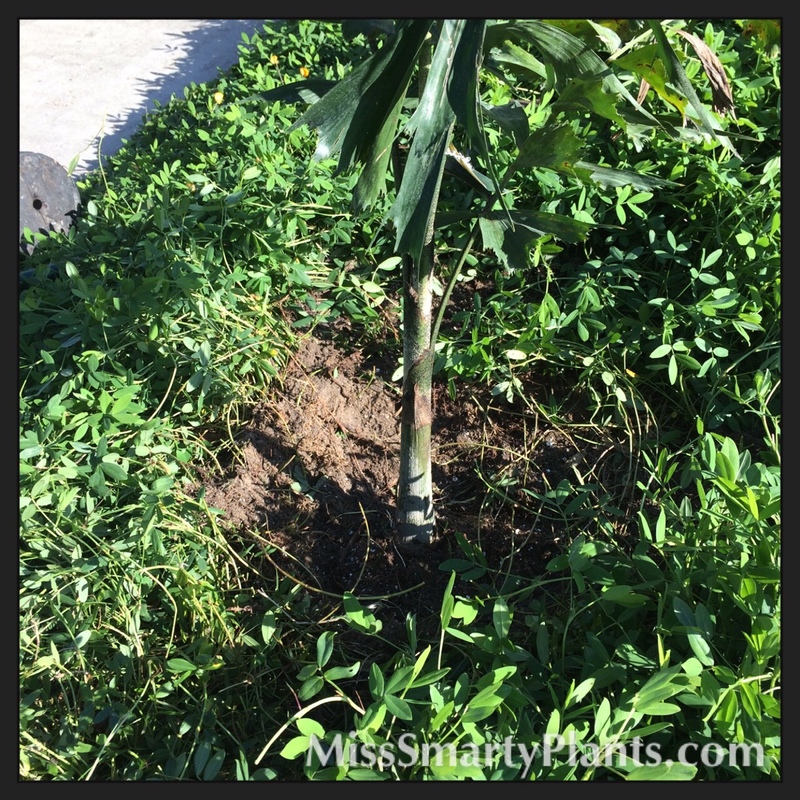 I like to make a raised berm at the edge of the hole so that when I water the new foxtail palm the water will soak in that area and not run off and away. I actually do this with almost all of my new shrubs to help keep them well watered during the first few months. I have to be honest, it will take me longer to write this than it did to plant this little foxtail palm. It does make me very happy to see the three palms along our driveway when I get home at night.